We only got to see the tail end of the new Batmobile when the first Batman v Superman: Dawn of Justice trailer came our way on Friday, but here it is in all it's glory in a new video from Bleacher Report, which see's LA Clipper's DeAndre Jordan (the biggest Batman fan in the NBA apparently) taken on the tour of the Batman exhibit, giving us our best look yet at Batman's monster of a new ride in action. With all the issues I have with the trailer, I have to admit the new Batmobile is absolutely badass! 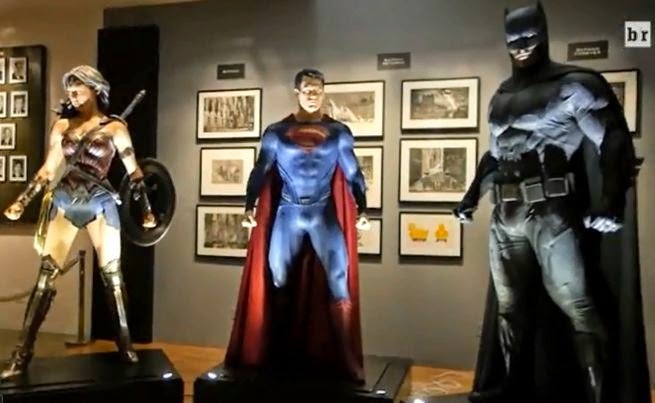 Also on display is a better look (read: properly lighted) at Superman, Batman, and Wonder Woman's new costumes, with the most interesting details being Wonder Woman's costume gets a palette change, going from the very Xena-esque brown we previously saw to a more traditional maroon and blue.